I got used to eating tagine in Fontainebleau. The town though small has two or more Moroccan restaurants, one of which was almost next door to our house. We frequented that tiny hospitable place with dark red walls and always well made food. I loved the tagine there, but once I made it at home I realized it can be even better when you can afford to cook it really slowly. Tagine, to start with, is a clay cooking dish with a special cone-shaped cover which has a hole on top of it. It is used in Moroccan and other North African cuisines to cook stews (meat, fish or vegetable), which are then served with couscous. The stews a cooked slowly and all the ingredients become very tender (almost start falling apart) when the dish is served. Another thing which makes tagine flavor so recognizable are dried fruits (apricots, figs, sultanas etc) and sweet spices, like cinnamon. It is one of those foods that are so nice for sharing. When the tagine is ready it is served to you right in its clay base (still dangerously hot) with a plate of couscous (plain or dressed with toasted nuts) on the side. Of course you can always order a tagine for yourself (and I have to say, I do enjoy it too), but there is so much fun in placing it in the center of the table and scooping out the stew while passing the couscous around. Now I can only wonder about this, but as far as I understand the tagine in our Fontainebleau place was made on order from scratch. If so, they couldn't afford to cook it in the oven for longer then some 30 minutes. When I made it at home this time I cooked it for an hour at 180C. I do not know what is more authentic, but I definitely prefer the result I got at home. The flavor was much deeper and more rounded. The recipe is somewhat funny. The list of ingredients is very long but the instructions fit into several lines. The only complicated thing for me here was not to leave some of the ingredients out occasionally. But, to be honest, even if you do, it will hardly damage the dish. You can play with combinations of vegetables, dry fruits and spices very liberally as long as they fit your taste. If you are not using the tagine itself, pick a large pan, which you will be able to use on the stove as well as later in the oven. Heat the oil in the pan you chose and add the garlic. Fry the garlic on medium heat till it is golden then discard the garlic and keep the oil. Add the cumin seeds and cook for half a minute till they get fragrant. Add the onions and cook stirring for around 10 minutes till they get soft (they shouldn’t brown). Add the cardamon, smoked paprika and chilli and cook stirring for 30 seconds more. Add the pepper, sweet potatoes, eggplant, tomatoes, dry apricots, sultanos, salt to taste. Place in the cinnamon stick and add the vegetable stock or water. Cover and bring to the boil. Transfer the pan to the 180C oven and cook for around 1 hour. Take out of the oven, stir in the chickpeas, half the parsley and mint. Add salt if necessary. Place the couscous in a heatproof bowl. Add salt and 600 ml of boiling water from a kettle, cover and set aside for 10-15 min. Slightly toast the almond flakes in a dry pan. Flake the ready couscous with a fork and stir in the almond flakes. 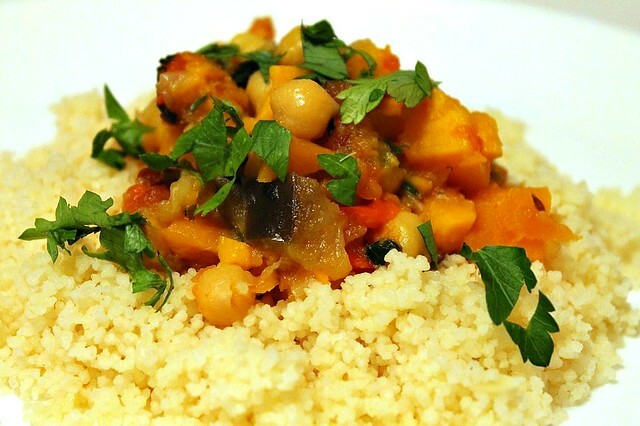 Serve the tagine over couscous or with couscous on the side, topped with the rest of fresh parsley. So love this entry! Looks delicious! When I was a kid my BFF came from Morocco, near Rabat. We used to eat coucous, too. And her mum also had a tajine, it looked weird to me back then. Thnx for taking me down memory lane.